It’s a good time to share this image of Danaus Plexxipus feeding on a healthy leaf of swamp milkweed (Asclepias Incarnata). Why? you might be asking yourself. As we review reports from NABA-CHAT contributors across the country, it has become apparent that Monarch caterpillars are scarce, verifiably scarce this year. Some people are so excited to find Monarch eggs and they are reporting their finds with much urgency. For Monarch butterflies and caterpillars, it’s an unusual year for sure here in the U.S..
We do not know the gender of the caterpillar in this photograph. We do know that it was not a 2013 caterpillar and that it is an one of striking beauty. Central casting could not have produced a more handsome actor. All this in Nichol field at Raccoon Creek State Park in southwestern Pennsylvania. 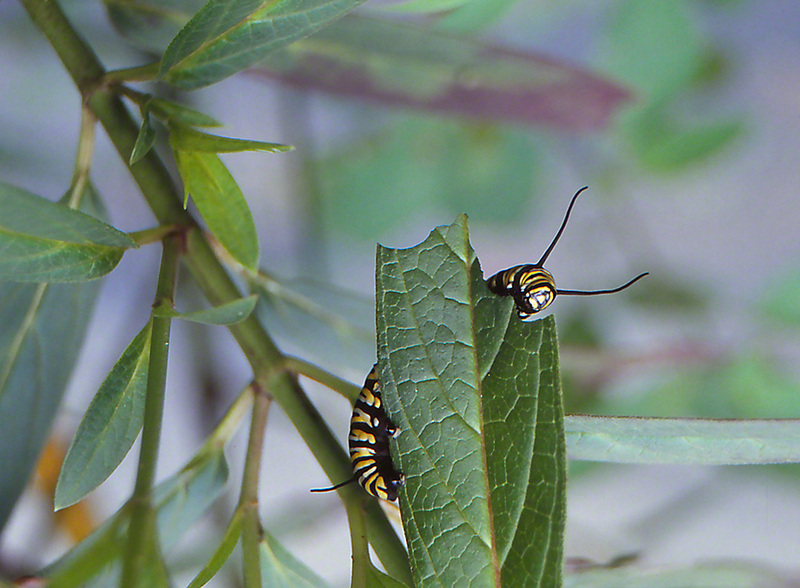 We’ve posted quite a few Monarch butterflies and caterpillars, as well as a Monarch chrysalises. All would have presented a great challenge to Tiffany or Van Cleef and Arpels or Cartier or David Webb, if their jewelry makers were assigned to replicate them.